by the Independence Hall Association in Philadelphia | In 629, Muhammad returned to Mecca with an army of 1500 converts to Islam and entered the city unopposed and without bloodshed. Before his death two years later, he forcefully converted most of the Arabian Peninsula to his new faith and built a small empire. Image courtesy Muslim Students Association, University of Southern California. A man meditating alone in a cave near Mecca received a religious vision. This vision laid the foundations for a new religion. The year was 610 and the man’s name was Muhammad. And the belief system that arose from Muhammad’s ideas became the basis of one of the world’s most widely practiced religions: Islam. Muhammad was born around 570 in the city of Mecca, located on the Arabian Peninsula. Both of his parents died before Muhammad was six and he was raised by his grandfather and uncle. His family belonged to a poor clan that was active in Mecca politics. Following the traditions of wealthy families, he spent part of his childhood living with a Bedouin family. Bedouins led fairly isolated lives as nomadic herders in the harsh Arabian desert. Muhammad’s experiences among these people most likely had a strong influence on the development of Islam. In his twenties, Muhammad began working as a merchant and soon married his employer, a rich woman named Khadijah. Over the next 20 years he became a wealthy and respected trader, traveling throughout the Middle East. He and his wife had six children — two boys (who did not live into adulthood) and four girls. By the time he was 40, he began having religious visions that would change his life. This new faith incorporated aspects of Judaism and Christianity. It respected the holy books of these religions and its great leaders and prophets — Abraham, Moses, Jesus, and others. Muhammad called Abraham “Khalil” (“God’s friend”) and identified him as Islam’s ancient patriarch. Islam traces its heritage through Abraham’s son Ishmael. Muhammad believed that he himself was God’s final prophet. There is only one universal God: Allah. Followers of Islam (Muslims) are expected to pray five times each day while facing Mecca. All Muslims are expected to pay a yearly tax that is mostly intended to help the poor and needy. For the entire month of Ramadan, Muslims must not eat, smoke, drink, or have sexual relations from sunrise to sunset. All able Muslims must make a pilgrimage (hajj) to Mecca at least once in their lifetimes. Mecca houses Islam’s holiest site, the Kaaba, which was believed to have been built for Yahweh by Abraham and his son Ishmael. 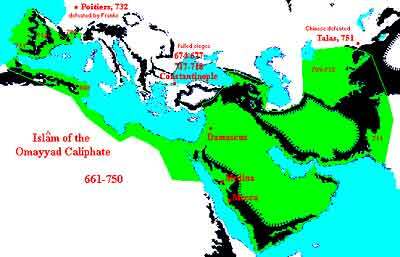 Islam spread at almost Internet-like speed, encompassing much of the former territories of the ancient Near East, North Africa, and Spain. Muhammad’s message was especially well received by the poor and slaves. But many people were opposed to his message. This opposition only seemed to make him more determined. After years of publicly promoting his ideas, he became so disliked that some began plotting his murder. 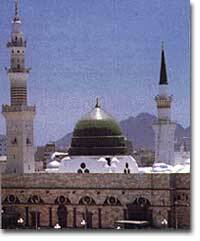 In 622, fearing for his life, Muhammad fled to the town of Medina. This flight from Mecca to Medina became known as the Hegira, Arabic for “flight.” The Muslim calendar begins on this year. In Medina, the local people welcomed Muhammad and his followers. There, Muhammad built the first mosque, or Islamic temple, and began to work to separate Islam from Judaism and Christianity, which had originally influenced him. Whereas his followers had originally prayed while facing toward Jerusalem, he now had them face toward Mecca. Muhammad continued to have revelations from Allah. The ideas from these revelations formed the basis of a poetic text called the Koran, which contains the fundamental ideas of Islam. Muhammad fought a number of battles against the people of Mecca. In 629, Muhammad returned to Mecca with an army of 1500 converts to Islam and entered the city unopposed and without bloodshed. Before his death two years later, he forcefully converted most of the Arabian Peninsula to his new faith and built a small empire. For most Muslims, jihad is a personal struggle against evil. The holy battles of this spiritual struggle are fought inside Muslims’ minds and souls. Sometimes, the struggle can take the form of a physical war against non-believers. Although this kind of jihad is referred to in English as a “holy war,” most Muslims believe there is nothing holy about war and that wars should only be fought against oppressors and aggressors. A minority of Muslims, however, places great importance on holy war jihads. This minority feels that Muslims must wage war against all nonbelievers. It is this conception of jihad that inspires Islamic extremist terrorism. Unfortunately, due to media coverage, this is the interpretation of jihad that most Westerners are familiar with. It should be reiterated that mainstream Islam is peaceful and rejects the idea of unprovoked war. Although the concept of jihad is widespread, it has not been accepted by the general Islamic community as one of the Pillars of Islam. Unfortunately, Muhammad had not designated a successor. The struggle over leadership that followed his death has divided Muslims to this day, creating a division in Islam between the Sunnis and Shiites. Despite these problems, a vast Islamic empire was created over the next 12 centuries that would build a base of worshipers unrivaled by any other religion.